Cellar Master Gilles Arramon follows the craft tradition that has been passed down from generation to generation, hand-selecting eaux-de-vie from the two highest quality crus in the Cognac region, Petite Champagne and Grande Champagne. Arramon makes Levon le Magnifique cognac in small batches at House Guy De Bersac, which is celebrated for its non-industrial popularity and includes reserves dating back centuries. Levon le Magnifique is non-industrial and made in small batches, just like cognac hundreds of years ago. Craft tradition is also a tradition of curiosity and exploration — the same values that inspired the very first cognac-makers. Along with his extensive traditional experience as a Cellar Master, Mr. Arramon holds a PhD in oenology, the science and study of winemaking. His wide range of knowledge extends to viticulture history and heritage, which has ancient roots in Armenia that suggest a link between winemaking and early civilization. Inspired by Armenian viticulture heritage, Arramon named his small-batch cognac Levon Le Magnifique, after one of Armenian history’s greatest figures, King Levon I, also known as Levon the Magnificent. By encouraging a vibrant cultural exchange between Cilician Armenia and the great powers of Medieval Europe, King Levon bridged the gap between East and West. During King Levon’s reign, Cilician Armenia formed strategic alliances with many European kingdoms, including France and England. King Levon personally befriended England’s French-speaking king Richard the Lionheart, fighting by his side in The Crusades. King Levon is also known simply as “The Great” or “Le Magnifique.” He presided over a golden age of economic growth, social progress and improved foreign relations. His legacy of brotherhood and exploration forged a lasting connection between Cilician Armenia and Western Europe. 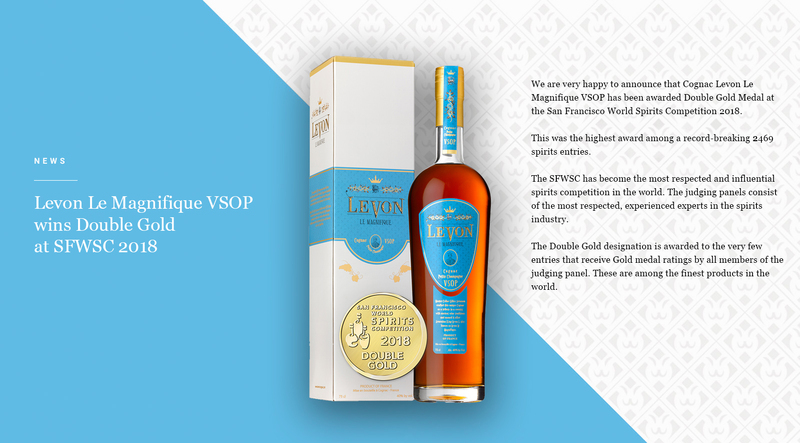 Cognac Levon Le Magnifique is made solely from grapes found in the two highest-quality crus (vineyard areas), Petite Champagne and Grande Champagne, located in the heart of the Cognac region. In the Petite Champagne and Grande Champagne crus, the soil consists of a thin layer of clay limestone covering a deeper layer of limestone and chalk. Grande Champagne features rolling hills, while Petite Champagne is more compact. However, the chalky soil found in both crus provides the optimal growing conditions for aromatic, flavorful grapes. For a cognac to be labeled Fine Champagne, it must be a mix of Petite Champagne and Grande Champagne that includes at least 50% Grande Champagne. This blend of eaux-de-vie from the Grande Champagne and Petite Champagne crus produces a distinctive flavor that is both powerful and complex. A smooth yet distinctive cognac with remarkable versatility and balance. This celebratory blend is perfect for either sipping or mixing. A fascinating mix of sweet and spicy aromas that includes delicate notes of fruits and flowers, vanilla and the hint of fresh oak. Rich, deep fruit flavors combined with spicy hints of gingerbread, cinnamon and honey. Superb balance and smoothness with a nuanced, lingering finish. Rich, complex aromas of fruit and exotic spices, with subtle floral notes. Delightfully fruity and rounded on the palate, with flavors of spiced fruits and nuts and the elegant hint of vanilla. Full and velvety, with a long, resonant finish. This evocative, sophisticated blend embodies Old World luxury and charm. It comprises hundreds of eaux-de-vie hand-selected from the Cognac region’s two most prestigious crus, Grande Champagne and Petite Champagne.